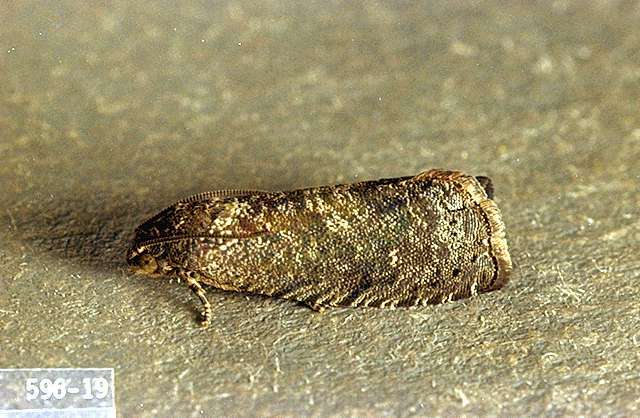 Pest description and crop damage Adult is a grayish-brown moth with a wing span of 0.5 inch. Larvae are creamy white to pinkish caterpillars with black heads and black shields on the thorax and last body segment. Their length ranges from 0.06 to 0.5 inch. Larvae bore and tunnel into shoot terminals, causing leaves and terminal to wilt and die. 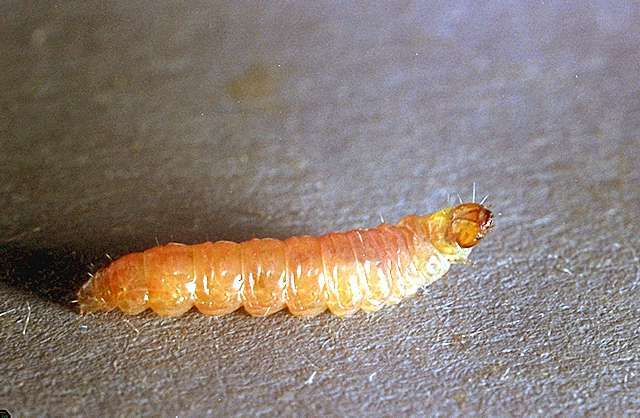 Larvae may bore into fruit, tunnel, and feed on flesh. 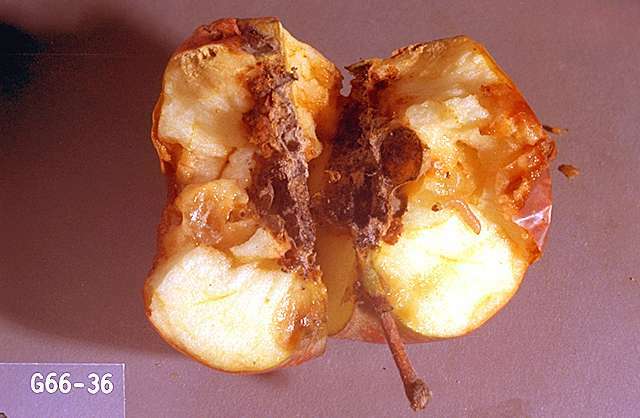 Distribution of this pest appears to be spotty here in the Pacific Northwest with isolated populations found primarily in neglected backyard fruit trees. This insect has not been a problem in Oregon orchards for several years. Biology and life history This insect overwinters as fully grown larvae in a hibernacula (silk webbing) in ground cover or tree crevices. In spring, pupation occurs and adults appear near bloom. 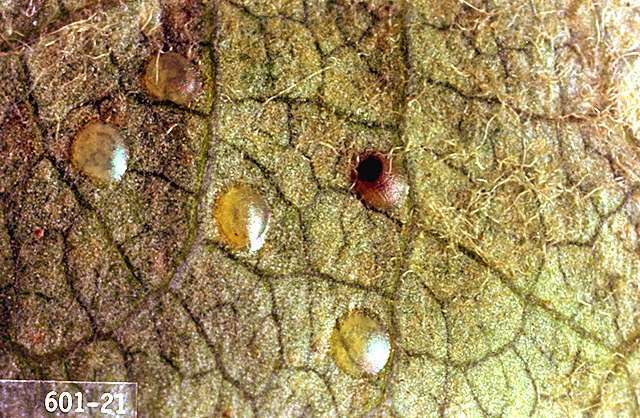 Eggs are laid on foliage and the larvae feed by boring into the growing shoots. There may be 3-4 generations per year. Later generations also attack fruit before seeking overwintering sites. Pest monitoring In fruit trees with a confirmed history of Oriental fruit moth infestations, scout for larvae and wilted leaves on shoot and twig tips in early spring. Monitoring traps baited with Oriental fruit moth pheromone can be used to detect the absence/presence of this pest in your area and can help better time pesticide applications. Spray applications and pesticide residues must be well-timed to contact the newly-hatched larvae before they bore into the shoot or fruit. For trees with a history of Oriental fruit moth problems, direct cover sprays around petal fall toward the first generation of larvae. Further spray applications in summer may be unnecessary if the first generation has been effectively controlled. Pheromone mating disruption works best in large orchard blocks and is not considered an effective option for backyard fruit trees. mating disruption pheromones-Not effective for orchards less than 10 acres. Checkmate OFM Dispenser at 100 to 250 dispensers/a. REI 0 hr. These dispensers release a synthetic insect pheromone that disrupts insect mating. Dispensers must be placed in the orchard before adult mating and egg-laying flights begin in spring. Careful scouting and monitoring are necessary to use the product effectively. Supplemental insecticide applications may be needed. IsomateOFM TT at 100 dispensers/a. These dispensers release a synthetic insect pheromone that disrupt insect mating. Dispensers must be placed in the orchard before adult mating and egg-laying flights begin in spring. Scouting and monitoring are necessary to use the product effectively. Warning: These products are toxic to bees. Do not use them during bloom or when bees are foraging in the orchard. chlorantraniliprole (Altacor 35 WDG) at 4.5 oz/a. PHI 10 days. REI 4 hr. flubendiamide (Belt SC) at 3 to 4 fl oz/a. PHI 7 days. REI 12 hr. methoxyfenozide (Intrepid 2F) at 10 to 16 fl oz/a. PHI 7 days. REI 4 hr. phosmet (Imidan 70W) at 0.75 to 1 lb/100 gal water (4.25 lb/a). PHI 14 days. REI 7 days. Extremely toxic to fish; avoid spray drift and surface runoff. spinetoram (Delegate 25WG) at 6 to 7 oz/a. PHI 14 days. REI 4 hr. Entrust 80W at 0.4 to 0.8 oz/100 gal water (1.25 to 2.5 oz/a). PHI 14 days. REI 4 hr. OMRI-listed for organic use. Success 2F at 1.3 to 2.7 fl oz/100 gal water (4 to 8 fl oz/a). PHI 14 days. REI 4 hr. May act slowly.